For my money, memes on the Internet don’t get any better than the Hitler one. You know, the one in which you take some current event (the more mundane, the better) and shove it into the scene from the German film Downfall in which Hitler is told in his bunker that he cannot win the war. The key to these (assuming you don’t speak German, of course) is to replace the actual subtitles with ones of your choosing about a different topic. Facebook/FriendFeed, Twitter, MySpace — all solid gold stuff. In fact, just this past January, while reviewing the iPad version, Erick called it “the meme that will never die.” But sadly, it looks like it may in fact die, at the hands of the studio behind it. Sure enough, many of the other Hitler meme parodies have started disappearing as well (Hitler on Xbox Live, for example). But as of right now, there are so many out there that are subtly different enough that plenty are still up. Still, you can probably expect YouTube’s smart content system to hunt down and find all of these clips sooner rather than later. Now may be the time to appeal to Constatin Film. Downfall is a great movie, but it’s also in German which sadly means that many people outside that country will never watch it. But I’d bet these clips have sparked an interest in the film beyond what any type of traditional marketing could have done. 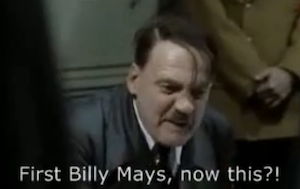 Mostly, I just really want to see Hitler’s reaction to the stolen iPhone 4G. 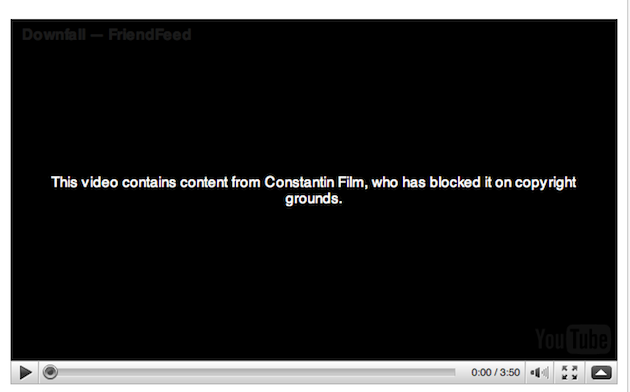 Also, someone really needs to make a video about Hilter being upset that Constantin Film is DCMAing Hitler parodies.